I’m sure you all have at least heard of Pinterest by now. If you haven’t, it’s basically a virtual pinboard. You can “pin” things you find on the internet and organize them into boards. I have a food board, crafts board, and even a castles food. The best part about Pinterest is you can see what other people pin and repin them to your boards. That’s where I find most of my ideas for recipes, DIYs, clothes, etc. However, I’ve been absolutely awful at following through with any of said pins. Yeah I have 120 recipes pinned.. but now what? I rarely ever put those recipes into fruition. I’ve probably made about 5 of the recipes I’ve pinned. I’ve made it my goal now to start actually making the recipes, doing the crafts, and even going to the places I’ve pinned. I’m starting here with these lemon brownies. I pinned these over a month ago and always had the ingredients in my apartment but never got around to it until now. And boy am I glad I did. Obviously you know I’m obsessed with lemon. Bright, sunny, fresh, summery, tart, refreshing lemon. LOVE in a bar. 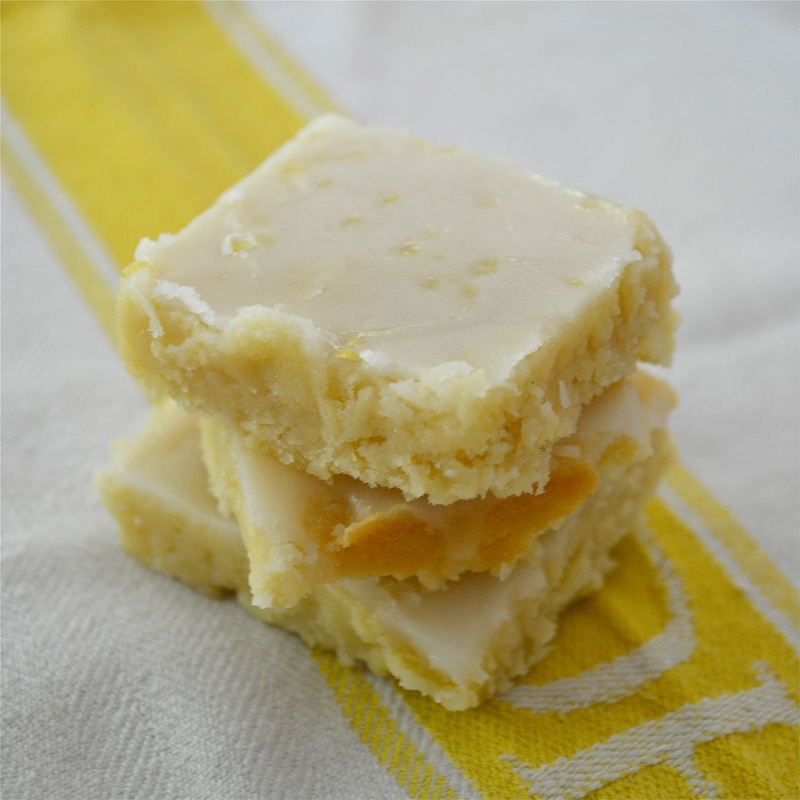 These lemony bars of goodness are a cross between a lemon bar and a brownie. My sister Katie likes to refer to them as whities because they aren’t brown.. so very clever that girl. 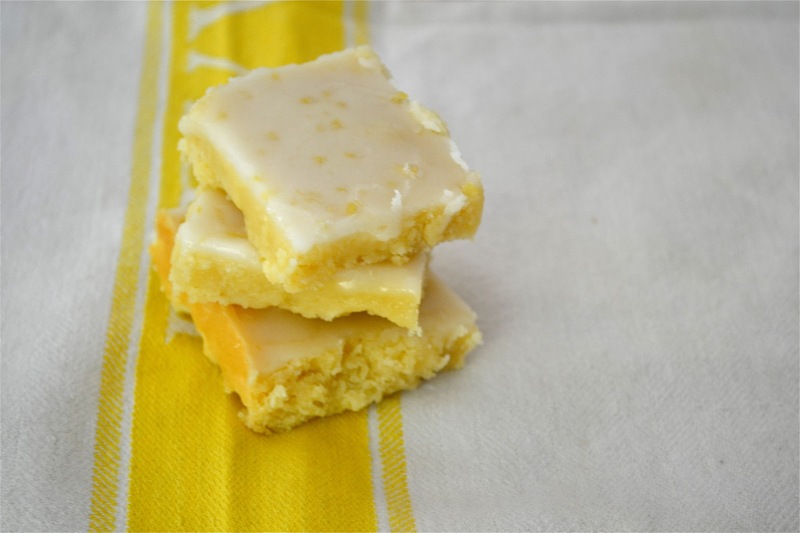 These lemon brownies are very moist and a little gooey but nothing a little finger licking can’t solve. Most of the lemon flavor comes from the glaze, so that’s something that you should definitely not skip in this recipe. It’s rich but oh so good! Oh and feel free to follow me on Pinterest here! Preheat oven to 350F. Butter a 9×13 inch baking pan. In a large bowl, whisk together the flour, sugar and salt until combined. In a separate bowl, mix together the melted butter, sweetened condensed milk, eggs, vanilla, lemon juice and lemon zest. Mix the wet ingredients into the dry ingredients until thoroughly combined. Spread the batter into the baking pan and bake for 25-35 minutes (mine took 30) until a toothpick inserted in the middle comes out mostly clean, it still might be a little gooey. Let the bars cool before spreading the glaze on top. To make the glaze, in a small bowl stir together the powdered sugar (confectioner’s sugar), 3 tbsp fresh lemon juice, and 1 tsp lemon zest until it forms a smooth glaze. When the bars have cooled, pour the glaze over the brownies and spread with a knife or spatula. Allow the glaze to harden before cutting into squares. Holy moly. I’d prefer these over brownies any day. They look so gooey and fantastic!